Home / Pattern Reviews / Sewing for my boys – the Jalie Nico Raglan Tee. 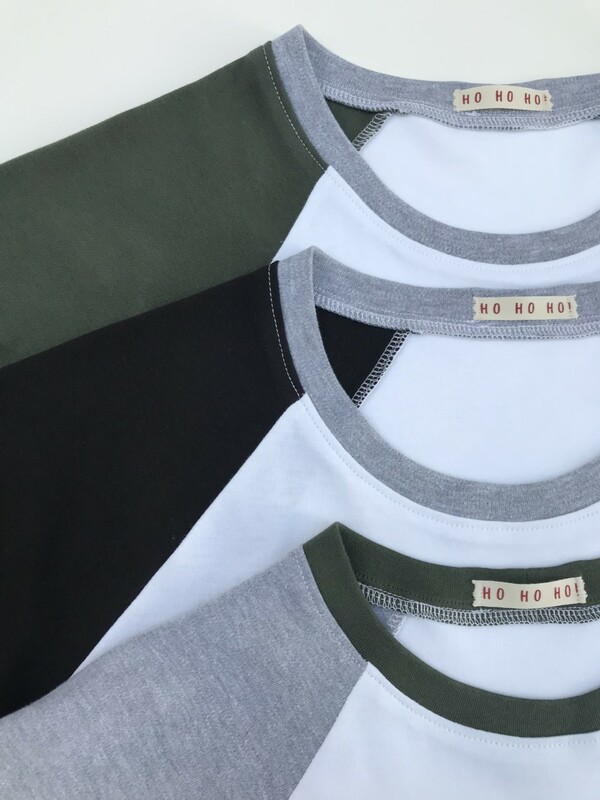 Sewing for my boys – the Jalie Nico Raglan Tee. Before I start, I must mention that I am limited with the number of photos that I have to share with you of this project. I did wonder whether or not to even include this as a blog post due to the lack of images, but have decided to go ahead in the hope that despite this, the written post itself might be helpful if you are in the market for a good boys/mens baseball t-shirt pattern. The reason for the lack of photos is that I made these three t-shirts for my husband and two boys as Christmas presents. Despite being super organised and buying the pattern aaaages ago from Sewessential, in order that I wouldn’t have a last minute rush to make them, I still ended up making them all in the last couple of days before Christmas when everybody was in the house and I was creeping around trying not to get found out. I had no opportunity to photograph them full length without someone spotting me, and as I don’t really think it is fair to pop photos of my family on here, we are just left with a quick little shot that I took of them on the kitchen table before wrapping them up. It is also worth sticking with this post until the end so that you can see what happened when I washed one of them the first time – despite pre-washing .. oh dear .. The pattern is the Jalie Nico Raglan Tee. This is the second time I have sewn a Jalie sewing pattern – last year I made the Cocoon Cardigan as my entry into the Cosy Cardi Challenge, and this is a cardigan that I reach for all the time. Jalie patterns have an impressive range of sizes on their patterns, 27 on this one in fact, and one of the reasons that I chose this pattern to make for my boys was that I only needed to purchase one pattern to cover the sizing of my 14 yr old, my 20 yr old and my husband. (In fact the smallest size on the pattern is age 2)! I chose to use some wonderfully soft cotton interlock jersey that I picked up from eBay. I had purchased some recently when I made my Christmas Tilly and the Buttons Frankie t-shirt, and was so impressed with how soft and lovely it was that I returned to the seller to buy some more for these projects. I wanted to keep the main body pieces on all of them white, and then mix and match the colours of the sleeve and neckband pieces. 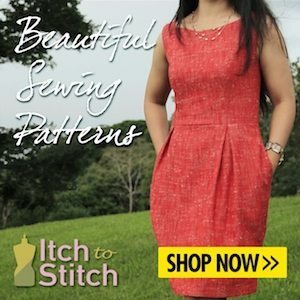 The pattern gives you three sleeve lengths to pick, and a choice of either a straight or curved hem. I kept all the hems straight, and chose long sleeves (in grey) for my youngest son, and short sleeves (in khaki and brown) for my eldest and husband. As you might expect with such a large range of sizes, there is a huge measurement chart to go through. I had to grade between sizes for a couple of my tees, but it didn’t take long before long I had three sets of traced out pattern pieces, all with their names scribbled on them so that I didn’t get confused. I also sketched out three little drawings and coloured them in, so that I had a reference on what pieces needed cutting in which colour and for whom! Although I cut them out all in one session, and they were all ready to go in three neat piles, I made a deliberate decision to only make one at a time, otherwise I knew that I would get muddled up. Time was now limited and I really didn’t need to be unpicking silly mistakes. The pattern was really easy to follow, and they were a quick make thankfully! Of course I didn’t have to opportunity to check them for size, but kept my fingers crossed that they would fit. To find out what size I needed to cut, I told my husband I was measuring him to get a rough idea for a top that I was going to make for my eldest (they are fairly similar in size) and measured my eldest telling him that I was making a secret top for my husband. Sneaky. I already had my youngest sons measurements from some recent school uniform purchases. For some reason, despite the absolute lack of time before Christmas, I still wanted to make handmade gift tags, and made up these little tags to add an even more personal touch. I’m pretty sure this was a waste of time, but I enjoyed making them. I’m happy to say that all t-shirts worked out really well and I was really pleased with how they fitted. I would have no problems recommending this pattern, a winner all round! My husband pointed out that in the 21 years that we have been married, this is the first thing I have ever sewn for him! No need to rush these things hey? So a great Christmas day was had by all. Hubby made the roasted brussels sprouts with garlic, bacon, pecans and blue cheese and swiftly splattered oil down the front of his t-shirt but no worries, it’ll all be alright when I throw it through the wash. Or will it..
Fast forward to Boxing Day. The light coloured washing goes in, including my husbands grease splattered t-shirt. All good. One hour 15 mins later, the washing comes out a very pretty shade of pink. Eek! Despite pre-washing all my fabrics, the brown sleeves of his new t-shirt ran and ruined the whole wash – his white work shirts and everything! I vaguely remember noticing during the pre-wash on the brown fabric that the water was a bit pink but didn’t think anything of it. My beloved pale grey kitty Cocowawa Chestnut Sweater is now also pale pink. Sad times. So lesson learned guys, sometimes one pre-wash just isn’t enough, and maybe for particularly dark fabrics like this brown one, take a good look at the colour of the water in your machine during the pre-wash and if you do spot any colour, run it through again just to be sure. Not to worry, I’m pretty sure that with my track record it’ll only be another 21 years before I sew him another, so he won’t have to wait too long.. The finished tops are beautifully constructed, but how sad that so many other clothes are now ruined – the clothes might have been pink but I bet the air was blue! The tops look beautiful and I love the labels! It looks like a great pattern.